Low back pain is one of the most common pain disorders today .It is a chronic condition characterized by a persistent dull or sharp pain per the lower back. It may be also associated with burning, stiffness, numbness or tingling with the pain shooting down the buttocks and the legs. When we stand, the lower back functions to hold most of the weight of the body. When we bend, extend or rotate at the waist, the lower back is involved in the movement. Low back ache is often precipitated by moving, lifting objects or twisting of the waist. 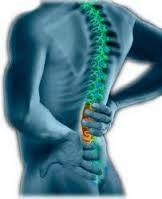 Severe pain in the low back can be quite debilitating to patients. Pain in the lower back restricts activity and reduces work capacity and quality of enjoyment of everyday living and turns daily life into a misery. Survey indicates that 70 per cent of the people suffer from low back pain at some time in their lives. The highest rate of back pain occurs among the 45 to 64 year age group. The incidence of low back pain is greater among women. In 90 per cent of the patients, low back pain resolves within six weeks, i.e. self limited. In another 5 per cent the pain resolves by 12 weeks. Less than 5 per cent of back paid account for true nerve root pain. Ayurveda holds that low back pain is a result of vitiation of one of the three principal or low back pain is an indication of Vata aggravation and bone and muscle weakness.